7/13/17: The following Jmol links contains multiple views of the complex. It is repeated several times below. A more nuanced understanding of the mechanism and linkage between H+ and e- movement derives from high resolution structures determined by Yano et al (2016). 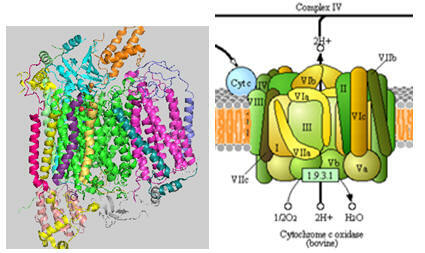 In their model (shown in the figures below based on the oxidized form of the protein, pdb 5b1a), protons from the negative (matrix) N side of the complex enter through a water channel and proceed to the positve (intermembrane side) through a H bond network (as described above and depicted below). These comprise the H Pathway. Directional movement is mediated by proton:proton repulsion aided by an increase in + charge on heme a when it transfers an electron to heme a3. Of course, proton:proton repulsion would move protons in both directions. Reverse flow back through the water channel is prevented by a conformational change on oxygen binding that closes the channel. 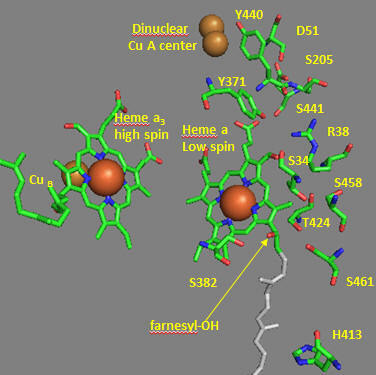 Ultimately 4 electrons are transferred from cytochrome Cs (in single electron steps) to the dicopper cluster, CuA, and then sequentially to heme a to heme a3 (near the copper B ion) to dioxygen to form water. The motion of electrons and protons are coupled electrostatically. The figure below gives an overview of these movements. 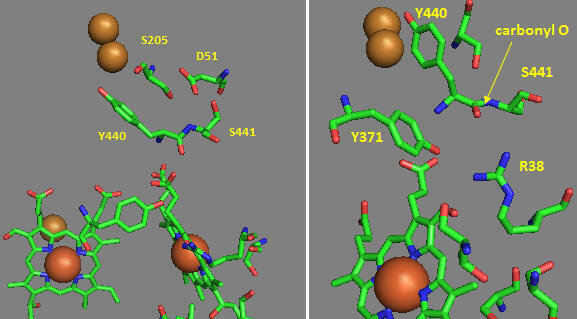 The small red dots are the oxygen atoms of internal water molecules (the rest have rest have been removed using Pymol). It should be apparent, given the number and location of the internal water molecules, that many would be involved in the proton translocation pathways. What's so interesting about this model is the detailed description of two types of protons, the ones that add to dioxygen and end up in water, and those that are vectorially transported to the IMS. 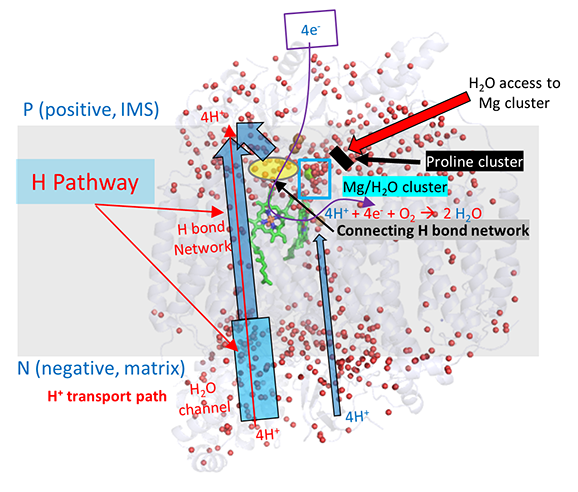 In their model, the H+s that end up being transported move through the water and H bond network through a connecting H bond link region to a Mg2+/water cluster. 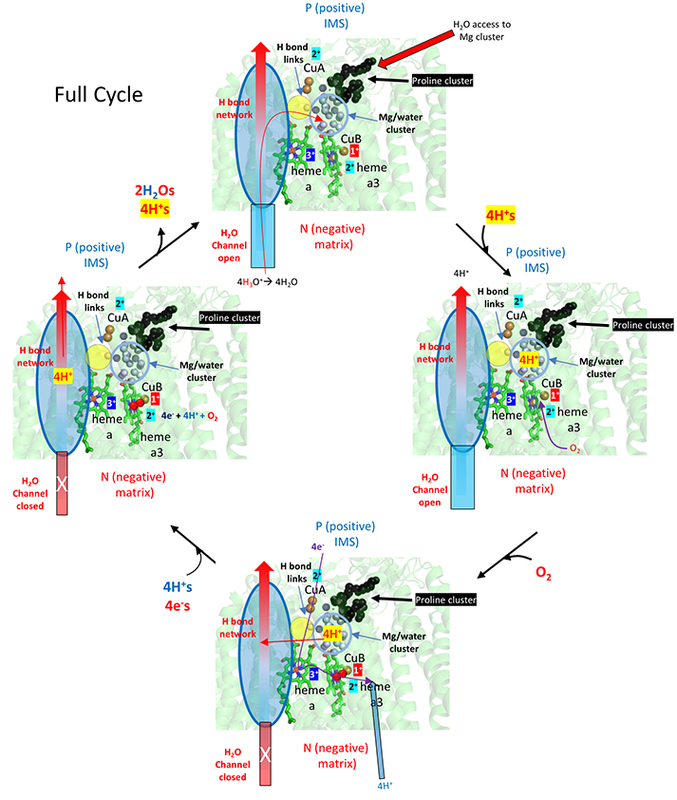 Since binding of oxygen leads to structural changes that closes off the water channel, all protons to be transported to the IMS must be bound in the cluster before dioxygen binding. The figure below show that initially, 4 H+s move through the H system to the Mg2+/H2O cluster. Oxygen binding the closes the water channels. This buildup of positive charges would certainly lead to a enhanced electrostatic attractions for the next phase of the reaction, the movement of electrons into the heme cofactors. Additionally, the 4 H+s in the cluster are probably prevented from leaking to the P side through water that are proximal (see above figure) by proline cluster, which presumably restricts the dynamical motion of the protein in that region necessary for proton movement. The figure does not show charge changes in the electron carriers. The figure below breaks downs the mechanism to show the addition of the first electron to the CuA (dicopper cluster), delivered from cytochrome C, and the subsequent transport of one proton from the fully proton-loaded Mg2+/water cluster after dioxygen binding. 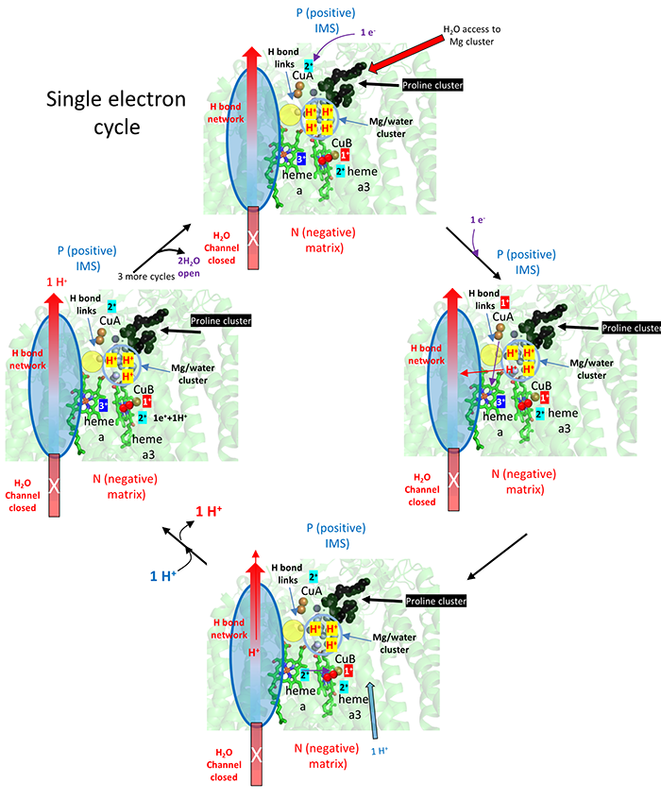 This figure does show the stepwise redox changes in the electron carriers. 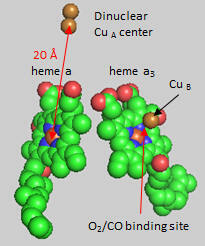 After CuA receives an electron from cytochrome C, it donates it to heme a and not to heme a3, even though both are close. The extra negative on heme a facilitates proton pumping thought the H pathways shown.